A Need So Beautiful (SIGNED) ARC Giveaway! (In case you couldn't tell from the title) I'm giving away my signed ARC. It's a hard thing to part with, but I enjoyed the book so much, I'll be purchasing a hard copy as soon as it comes out. Details for how to win are at the bottom of my review! (Charlotte) is one of the Forgotten, a kind of angel on earth, who feels the Need—a powerful, uncontrollable draw to help someone, usually a stranger. I'm a fan of Suzanne's Naughty List series, so I was nervous because A Need So Beautiful sounded so different. (Well, it also sounded AWESOME, but still.) As it turns out, I had absolutely no reason to be nervous. Yes, this book is way different, but it's also way way way good. I'll definitely be reading the sequel as soon as I can get my hands on it. (In case you can't tell . . .) The premise is super original. I haven't read anything like this in recent memory. I wanted to take my time reading the book, because I didn't want it to end--but I couldn't put it down. A Need So Beautiful is different from a lot of other YAs out there for two reason: 1) Charlotte starts the book off already knowing that she's different/paranormal and 2) she's already dating the love interest. Don't get me wrong, I love books that take me along the discovery / falling in love path--and this book doesn't disappoint! It's just in a different way. In a clever way. In a more . . . in depth way. Speaking of love: Harlin is Charlotte's boyfriend, and he is the PERFECT kind of bad boy with a good heart. He's rough around the edges, sure, but not once did I get mad at Charlotte for dating him. And that can be kind of rare, for me, with the bad boys in books. Another thing that sets A Need So Beautiful apart is that while it is definitely paranormal, it doesn't hold back in the slightest from more contemporary-type character troubles. I loved that the secondary characters face very real issues--the same ones that some of today's teenagers face. The same ones that end up getting pushed to the back burner in a lot of the other YA paranormals out there. Suzanne fits them in organically and without overcrowding the plot. Here's how to enter: Leave a comment with your email address. But none of that is required. The ONE thing I ask is that if you win, you'll spread the word about all the amazing things about A Need So Beautiful. The giveaway closes on Friday, June 10th. 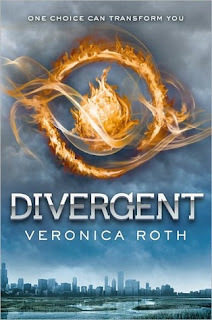 Had you asked me a week ago, how to spell divergent, I would have started with the letter D. Today, though, I think it starts with the letter A. How do you spell Divergent? I know, I know. I'm a little late to this party. But my TBR is ginormous. And it took me a minute to make my way to Divergent, by Veronica Roth. And what a hot mistake that was. If you haven't read it yet, because it's not at the top of your TBR? BUMP IT, ASAP. Don't wait another month, another week, another day. Because I'm telling you now, I will say I told you so. And I'll stick my tongue out and wag my fingers from my ears, too. Okay, so you start off learning that there are these five factions: Dauntless (the brave), Candor (the honest), Erudite (the intellectual), Amnity (the peaceful), Abnegation (the selfless). When you turn sixteen, you have to take a test which will indicate which faction you're fitted for. (Though, the decision is ultimately yours to make.) But the test is sooooo super cool, and also sooooo super creepy. When Beatrice's test began, I was sucked into the book with no chance of escape. The choices Beatrice (aka Tris) makes and the consequences that follow are stunning to read. I found my heart rate increasing and my mouth hanging open on several occasions. And not only from Tris's actions. All of the characters are complicated and intriguing. Oh--and I don't think I've ever hated a character as quickly as I hated Eric. Seriously, you'll see. Just wait. Even typing his name gives me a little venomous charge in my veins. The world building is . . . Honestly, I find myself at a loss with how to explain how thorough and brilliant and seamless it is. Well, I guess I just did. But still. Those words barely do Veronica's talent justice. I think so much and stretch my brain in so many directions--using, abusing, and working it out so hard--I swear I'm surprised I haven't developed telekinetic powers yet. Seriously, I feel like I should be able to look across the room and dead lift one of my bookcases with just my eyes. Or at least a Twizzler or something. I have plenty of those around to practice with. That picture is just a picture. I know. You were all excited there for a second, right? Wait. What do you mean that doesn't look like a floating pack of Twizzlers? Ummmmm, anyway, my point is . . . pretty much already covered in the first sentence. I love the thought process though, the mental workouts. Making pieces fit together, creating rules and figuring out how to make my plot work within them. Pushing my characters to grow--when, oh holy mattress, they can be so stubborn. It all makes me happy, makes me thrive. So I'm not really complaining. I'm just saying: I can't believe I haven't developed some sort of mental super power by now. Thanks so much to everyone who read and commented on my interview with Amy Holder! If you didn't win a copy of The Lipstick Laws, I sincerely hope you'll go out and buy a copy. Congratulations, winners! Please send me an email with your mailing addresses and I'll get your prizes in the mail this week. Don't forget. I've got enough for FOUR winners! Amy! Thanks for stopping by today :) Let’s start with my one of my favorite things about The Lipstick Laws… The humor!! April, your main character, had me cracking up from the very first sentence all the way to the end. How did you keep the funny going throughout the entire novel? Thank you so much! That is the best compliment you could give me about my book! Truth is, I’m not a super serious person, so I typically like to keep things light and fun. When April’s character came to me, it was a very quirky, self-deprecating, sarcastic take on teen angst… so her voice plus my avoidance of most things serious seemed to meld well. I love to laugh and I wanted to have fun writing this book, so it’s great to know that it came across throughout the story. Oh, it totes came across! Now . . . Fact One: You studied psychology and sociology in college. (That’s right, I stalked you enough to figure these things out. taptaptap Hear those rocks hitting your window? *waves*) Fact Two: You nailed the popularity mindset and teenage interactions in The Lipstick Laws. Coincidence? I think not… No, seriously—you tell me: was it a coincidence, or did your background help you write the story? Wow! Thank you again! Your compliments are seriously helping my inferiority complex. Are you for hire? To answer your question, I’ve always been fascinated by human behavior and am naturally a people watcher. This is what led me to study psychology and sociology in college. I also think this innate interest helps me build characters and their interactions, because I believe writers have to be good observers. This, paired with the fact that I never fully grew up helped me get in a teen mindset while writing this book…in fact, I’m still sort of stuck in it. YES! I never fully grew up either. Maybe that's why we get along so well. A large portion of my blog readers are aspiring writers. And you’ve made it—so share! Let us live vicariously through you :) What’s been the best part of your journey so far? What’s been the hardest? Any tips for those of us (*clears throat* … *points at self*) working toward that dream of publication? And, of course, what is your writing process? The best part of my journey so far was the feeling of achievement, adrenaline, joy, and validation that I felt from getting “THE CALL” (or in my case it was an email) from Houghton Mifflin Harcourt wanting to publish THE LIPSTICK LAWS. I will never forget how amazing that moment was! Seeing my book in a bookstore, getting my agent, and receiving television interest from a producer that I admire have all been huge highlights as well! The hardest part so far has been dealing with the bad along with the good. I’ve quickly found out that my book isn’t going to please everyone, naysayers love naysaying, most writers experience disappointments (minor or major) in the industry at some point or another, and there isn’t always enough chocolate to get through tough revisions. Granted, the good far outweighs the bad… but this industry is filled with ups and downs and you need thick skin to be able to bounce back from the downs. My tips are to practice your writing craft daily, read the genre you want to write, study the publishing market, never give up, and network your tail off (the more people you know in the industry, the better your chances will be to get a personal referral). I also think it’s important to be careful not to stifle your own writing by comparing it to other writers’ successes or failures. Always avoid a creative comparison coma by celebrating the uniqueness of your individual writing style and journey. My writing process can vary depending on what I’m working on… but I usually expand an idea spark for a story by asking what-if questions. Once I’ve brainstormed most of the plot, I’ll create a loose outline that keeps me on track, but still allows for ad-lib surprises and story growth. I usually edit as I write, which will add time onto writing the first draft, but it spares me a lot of the pull-your-hair-out-revision-headache later on. Once I’m done with my rough draft, I’ll put it away for a bit and come back to it with fresh editorial eyes to revise. When I feel it’s complete and clean, I’ll celebrate like crazy! This usually involves chocolate, high-caloric drinks, indulging my reality show addiction, and dancing the robot in a hula skirt. Clearly I know how to party. You dance the robot? In a hula skirt? Ummmm. I MUST SEE VIDEO PROOF. Seriously, send me some! Or better yet, we should have a hula skirt-wearing robot dance off. What do you say? What? You don't want to go up against my mad robot skillz? SIKE. You'd totally win... Soooo anyhoo, let’s chat books—four questions in one! Ready? Set? GO! What are you currently reading? What’s been your favorite book to read so far this year? What’s your favorite book of all-time? What book are you most excited to read that hasn’t yet come out? 2) I can’t choose! I have so many friends debuting this year, and all of their books are amazing! 4) I’m really excited to read POPULAR by Alissa Grosso. It comes out this month (May)! Thank you! I’m hoping to write more books in various genres and age groups, but right now I’m working on another humorous contemporary YA novel with a bit of a paranormal twist. I’m also thinking about a Lipstick Laws sequel…but that isn’t set in stone yet. Another exciting thing that’s happened recently is that my TV rights for THE LIPSTICK LAWS have been optioned, so I’m keeping my fingers, toes, eyes, elbows and hair crossed hoping it will go to production. In the meantime, it’s tricky to write with all of these crossables crossed. Dude. TELEVISION RIGHTS. So. Awesome. Can we have a viewing party at your place when it first airs?? What? I do too know where you live. Remember the window tapping from earlier? QUICK! The fate of the WORLD* * * depends on your answers to my final red-hot questions! Would you rather give up your Chi straightener or never eat grape pie again??? (I mean, as a Chi girl myself, I know which one I’d choose. Just sayin’.) I’m with you on this one! I would give up grapes altogether if they came in between me and my CHI! Best grunge musician, alive or dead? This question is slightly evil seeing how I was (and may still be) clinically obsessed with grunge music. I’ll say Chris Cornell from Soundgarden… but Eddie Vedder and Kurt Cobain can’t go without being mentioned. See, you made me cheat by asking this question – shame on you! What’s the first thing you see in this inkblot? I see a circus clown with a cocktail shaker on his head and two abnormally shaped birds perched on both sides of his face looking at each other. Perhaps this is part of the circus clown’s act, or he just likes to go about town balancing a cocktail shaker and birds on his face. Hey, we all have our quirks; I’m not judging him…or the birds for that matter. Er… does this inkblot translation mean I’m crazy… or a strange bird-watching clown woman? Hmmm…on second thought, I don’t think I want to know that answer. Yeah, I'm pretty sure you're a strange bird-watching clown woman ;-) But it's cool. Because I love bird watching. And clowns. Okay, not really. Clowns scare me. But YOU don't. Because you're awesome. Seriously, thanks so much for stopping by! Come back anytime. Now for my bloggie friends: Amy sent me enough swaggliciousness to send out FOUR packages!! So, if you want to enter to win some swag, all you have to do is leave a comment with your email address! And one commenter will win a copy of The Lipstick Laws! The giveaway will close on Friday at midnight. I'll announce the winners over the weekend. * * *Okay, the fate of the WORLD didn't really depend in the answers, but still. Isn’t it more fun this way? My review is below, but make sure to stop back by tomorrow! Amy will be here for an interview--aaaaand I'll have some swaggity swag to give away. (From Goodreads) At Penford High School, Britney Taylor is the queen bee. She dates whomever she likes, rules over her inner circle of friends like Genghis Khan, and can ruin anyone's life with a snap of perfectly manicured fingers. Just ask the unfortunate few who have crossed her. I made the mistake of starting The Lipstick Laws at 11pm. And I was TIRED the next day because I read until I was finished with it. I was cracking up from page one. No, paragraph one. No, sentence one. Amy Holder's funny meter for girls reminded me a lot of Don Calame's funny meter for boys (in his book Swim the Fly) in that I laughed almost once (or more) a page--and many of those times out loud. There are many great things about this book, but my absolute favorite is the main character, April Bowers. She's quirky and snarky and obsessed with stuffing her bra. (Get why this might have been so funny yet?) She falls under the spell of what it's like to be popular--and does things she doesn't want to, but not in that spineless way I've read in other books. She stays true to character (at least in her thoughts) the entire time. Amy created a character flawed enough to drop believably into the world of popularity—but funny and sweet enough to keep me rooting for her, regardless of the bad decisions she stumbles into. The story's fast-paced and the prose is smooth. It's an easy read, almost effortless in the way the words flow across the page. I recommend this book to anyone who enjoyed the movie Mean Girls (um, who didn't???) I can't wait to see what Amy's got coming next! So, your mission (should you choose to accept, and omg you'd better . . .) is to go out and get yourself a copy PRONTO :) Find The Lipstick Laws HERE. and sara came tumbling after . . .
Sooooo I just wanted to let you know that I've started a tumblr. No, sillies. Not like that. Also, guess what day I prescheduled this post on? I mean, let's be honest... Do I ever? But in this case . . .
Ummm let's just say I'm learning as I go. And also, especially yes now. Anyhoo. It's here (http://babblingflow.tumblr.com/) if you want to check it out. And I post pictures that inspire me and songs and other pretty things. QOTD: Do YOU have a tumbler? If so... Gimme your link. This was a storage bin made of sandstone slabs and used for storing corn, beans, and squash. The openings at the top and in the front were covered with thin stones, then sealed with adobe to prevent rats, mice, and weevils from entering. The area behind the rooms was used for a trash area. They also kept some of their turkeys penned up in it, to feed from the refuse areas. Also, in the winter, burials were made in the the trash piles, which were easy to dig in. When a body was buried there it was surrounded by perfectly dry material, such as ashes, dust, corn cobs and tassels and turkey droppings. The chill of winter prevented decay and the body simply dried out and became mummified. As long as no moisture reached it, it would remain unchanged for centuries. This circular pit was the sacred kiva and was used by the men as a ceremonial chamber. Sacred articles were placed in the square openings built into the wall. The small hole in the floor is a symbolic opening in the earth called the Sipapu, and served as a passage way for the spirit of the person to enter and exit at birth and death. 100% chance I'm writing this into a story someday . . . This structure was a four family, four room home. The large rectangular openings are doors, the smaller is a window. (The window is closed with a window stone--the doors were closed with door stones.) The small pegs sticking out from the top of the structure were used to hang meat and vegetables to dry in the sun. "Their history disappears suddenly from the archeological record in the late 1100 AMD. No Pueblo Indian group living today can trace their lineage back to the Mimbres Indians." Approximately ONE MILLION shots of me trying to capture scenery in the shades. Because I'm deep like that. Also, I couldn't breathe that high up and got dizzy. 6,626 feet above The Royal Gorge. Whom I lovingly refer to as George. Yep. I totes walked across this. One amazeballs trip. I can't wait to go back to Colorado. I'll def be doing Nashville and Memphis again someday. First of all, Happy Mother's Day!! Anyway, hop over to Natalie's blog if you want all the deets. one attempt to eat BBQ. The line was too long, so we got hot dogs instead! We're a little messy when we eat ribs. But, dude, they were SO GOOD. Fabulous Johnny Cash cover band!! A day in Dodge City, where we played around at Boot Hill & Front Street for a while. And, okay. That doesn't really make sense to say. But I still wanted to say it. Because it's western. Right? A kinda pretty wreath, right? IT'S MADE FROM HUMAN FREAKING HAIR. Just thought these little flowers were pretty... and also random. This post is already so. freaking. long. I'm sure your eyes are blurred. And I heart you, so I want to save your eyesight. Because I'm so nice. QOTD: Other than the state you live in, which state did you visit last, and what was your favorite thing about it? AOTD: The last state I visited was Kentucky--which was NOT a part of my Colorado trip. We went over Easter weekend to visit el hubster's family. Which was my favorite part :) That, and the horse races!